• Categorized under Disease,Health | Difference between pneumonia and lung abscess. Pneumonia and lung abscesses are both serious medical conditions affecting the lung tissue that need vigorous medical treatment. A Lung abscess is characterized by death or necrosis of the lung tissues that occurs along with the development of pus. This forms, when the lung tissue is destroyed by a severe bacterial infection. 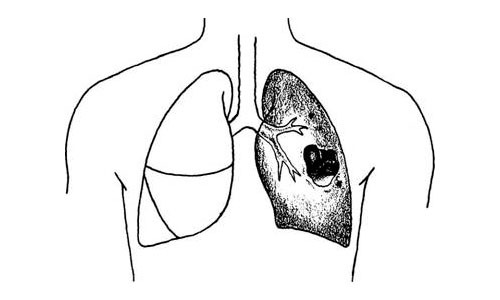 The infection can occur after aspiration, due to a lung tumor or due to the presence of a foreign body within the lungs. Once the tissue becomes necrosed or dead, bacteria invade and flourish in such tissue further destroying it and creating a pus filled cavity that is called an abscess. Pneumonia refers to lung inflammation that can occur due to chemical injury, infection by viruses, bacteria or fungi, or aspiration of food into the lungs. This inflammation of lung tissue or parenchyma leads to high fever with shivering, shaking chills, severe cough with loss of appetite and weight. Pneumonias are classified according to the symptoms into typical and atypical ones. Also, they can be classified according to the lobe of the lung affected and according to the organism causing the infection. Lung abscess are produced by bacteria that can survive without oxygen also called as anaerobic bacteria. The most common site for such bacteria is oral cavity. Due to infections of the mouth, throat, teeth or gums, these organisms can be swept off into the lungs. Conditions such as altered consciousness, coma, poor cough reflex or poor swallowing ability as seen in elderly or paralytic patients are common examples leading to aspiration. Pneumonia can occur due to an infection of viruses, bacteria, fungi or etc but the individuals prone for such infections are those having a compromised immunity as in cases of HIV, cancer, those suffering from chronic lung, liver or kidney disease, alcoholic patients and malnourished individuals. Injury to the lung leading to pneumonia can occur due to inhalation of toxic metallic fumes in industries or due to aspiration of food/foreign body into the lungs. A common risk factor is alcoholism. In lung abscess, the patient typically presents with a low grade fever with lethargy, wet cough and often, foul smelling sputum with blood, weakness, and difficulty in breathing. These patients usually report of an associated dental disease or a tooth decay. In pneumonia, the symptoms vary from mild, moderate to severely ill patients. The history includes high grade fever with chills, loss of appetite and weight, difficulty in breathing, pain in chest on deep inhalation and cough with sputum production, with or without blood. In severe cases, due to deficient oxygen supply the patient may even become confused, and disoriented. Lung abscess treatment consists of antibiotics which are continued till the x-ray shows a clear lung field. Also, drainage of pus might be done in case it is collected in the pleural cavity (empyema). In cases of a very large abscess, lobectomy might be needed wherein the entire affected lobe is removed. Pneumonias are treated with an oral antibiotic therapy initially, meanwhile a sputum culture test is done and the specific organism is identified to start with an appropriate antibiotic therapy. In cases of pneumonia, special attention is given to the supportive therapy such as hydration, bronchodialation and oxygenation. Pneumonia is a lung inflammation and the disease develops due to any inflammatory process. If left untreated it is followed by lung abscess, where there is a pus collection in an already inflamed lung tissue. In lung abscess, the lung tissue is destroyed and a cavity filled with pus is formed while pneumonia shows diffuse inflammation of the lung parenchyma. Treatment is drainage of pus and antibiotics for an abscess while pneumonias are treated with antibiotics alone. rachita. "Difference between pneumonia and lung abscess.." DifferenceBetween.net. November 17, 2014 < http://www.differencebetween.net/science/health/difference-between-pneumonia-and-lung-abscess/ >.